SGK offer a range of entrance porches in aluminium that will provide a contemorary welcoming entrance whilst at the same time adding value to your home and providing you with additional space. All our aluminium porches are bespoke, unique to your home and can be customised with a choice of door and window options and wide colour choices. Whatever aluminium porch we work with you to create, it will make your home better, warmer and more energy efficient. SGK are your local entrance porch specialists. 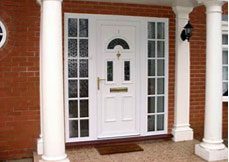 We individually designed all our entrance porches to suit your desired space. All are available in a choice of roof styles, aluminium or PVCu doors and windows and the latest in energy efficient double glazed units. The advantages of an aluminium entrance porch. A choice of sliding, swing or even folding doors. Traditional or modern porch designs.